Road marking materials provide visible signs on streets, motorways, curbs, berms, driveways, parking areas, sidewalks, and airfields. They are typically classified into two types: performance-based and paint-based markings. Performance-based markings are further divided into the following categories: thermoplastics and cold plastics. Paint-based markings include solvent-based, water-based, epoxy, and polyurethane-based paints. Paint-based markings are estimated to be a key segment of the global road marking materials market during the forecast period. The growing demand for water-based paints is expected to propel the road marking materials market over the forecast period. Performance-based markings include thermoplastics and cold plastics. Thermoplastics are a major material used in road markings, specifically a powder paint that has to be heated up to 200? C and then sprayed onto road surfaces. Solvent-based paints are majorly produced from acrylic resin dissolved in organic solvents such as esters and ketones. They are inexpensive and exhibit better control of drying and improved adhesion to asphaltic and oily surfaces. Water-based paints are quite similar to solvent-based ones in terms of solvent evaporation causing drying. According to the report, the global road marking materials market was valued at US$3.50 bn in 2015 and is anticipated to reach US$5.66 bn by 2024, expanding at a CAGR of 5.5% between 2016 and 2024. The report segments the road marking materials market based on application into airport marking, road marking, factory marking, and car park marking. On basis of application type demand for road marking materials was significant in 2016, due to the growing awareness towards road safety and need of high degree of visibility during nighttime travels. Road marking includes double yellow line marking, white line marking, and single line marking, which comprises highways and motorways, private roads, bus and cycle lanes, and pedestrian crossings. The selection of road marking material depends on its durability, price, and method of application in the region. In terms of market share, the road marking application was followed by the factory marking and car park marking segments in 2015. Factory marking includes safety, aisle, and space marking in areas such as forklift working spaces, unsafe zones beside dangerous or heavy machinery, loading bays, safe designated walkways and stairs, workshop demarcations, internal floors in warehouses, distribution and logistics centers, and other factory environments. The development of retail and industrial sectors such as businesses such as supermarkets, city centers, and hotels and the increasing number of automobiles have fueled the demand for car parking. 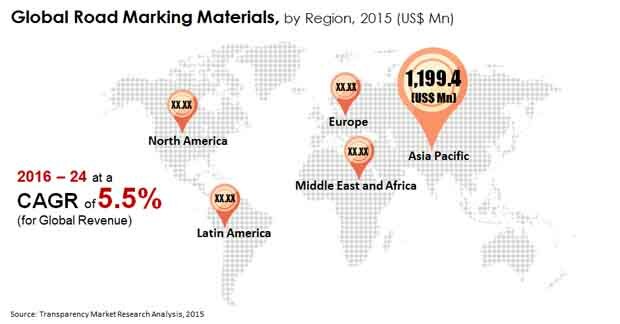 In terms of geography, the market in Asia Pacific held the dominant market share in the global road marking materials market, followed by Europe and North America in 2015. Asia Pacific is anticipated to retain its dominance throughout the forecast period. This is due to the growing awareness towards road traffic safety in the region. The vast rise in up and coming road networks and infrastructure development projects in emerging economies such as China, and India in the region are expected to boost the demand for road marking materials during the forecast period. In developed economies across North America and Europe, stringent environmental norms are expected to restrict the demand for paint-based road marking materials in these regions during the forecast period. The market for road marking materials in these regions is expected to witness growth at a low pace owing to stagnancy and legislative norms working against paint-based materials. Some of the leading vendors operating in the global road marking materials market are The Sherwin-Williams Company, Geveko Markings, Aximum S.A., Kelly Bros Erinline, Swarco Limburger Lackfabrik GmbH, and Ozark Materials LLC. Road marking materials provide visible signs on streets, motorways, curbs, berms, driveways, parking areas, sidewalks, and airfields. They are typically classified into two types: performance-based and paint-based markings. Performance-based markings are further divided into the following categories: thermoplastics and cold plastics. Paint-based markings include solvent-based, water-based, epoxy, and polyurethane-based paints. Paint-based markings are estimated to be a key segment of the global road marking materials market during the forecast period. The growing demand for water-based paints is expected to propel the road marking materials market over the forecast period. The report provides in-depth analysis and forecast of the road marking materials market on the global as well as regional level. The report includes forecast for the period from 2016 to 2024 in terms of volume (kilo tons) and revenue (US$ Mn). Quantitative data has been derived through extensive secondary research of the global road marking materials market. Secondary sources typically include company websites, relevant magazines, government documents, and press releases. The top-down approach has been adopted to derive the regional numbers from global revenue and volume figures. Furthermore, the bottom-up approach has been employed to derive data for various type and application sectors based on demand for road marking materials in each geographical segment. A combination of top-down and bottom-up approaches helps in validation of the quantitative data of the market. The data was further validated with the help of primary research with industry experts to ensure accuracy of derived numbers. Detailed analysis of various factors driving the global road marking materials market has been included for astute decision making. Impact of these drivers during the forecast period has been included with data to substantiate research findings. Furthermore, factors restraining market growth have been included for better understanding of the market. Impact of these restraints has been analyzed over the forecast period. The report also comprises various opportunities available for market growth over the next eight years. Opportunities entail untapped or recently explored factors that are anticipated to drive the road marking materials market during the forecast period. The report includes value chain analysis to help understand the industry thoroughly. Value chain analysis comprises detailed evaluation of the roles of various entities involved in the road marking materials industry, from raw material suppliers to end-users. Various processes employed in the manufacture of road marking materials have been included in the value chain analysis. Porter’s Five Forces model has been included to determine the degree of competition in the market during the forecast period. Furthermore, market attractiveness analysis has been conducted to analyze application segments that are expected to be lucrative during the forecast period. This is based on various factors such as market size, growth rate, profitability, raw material procurement, and competition in each application segment. Based on type, the road marking materials market has been segmented into paint based marking and performance based marking. Based on application, the road marking materials market has been segmented into road marking, factory marking, airport marking, car park marking and others. The report comprises detailed analysis of all the segments in the regional and global markets and forecast based on current and future trends in the industry in terms of volume (kilo tons) and revenue (US$ Mn). In terms of region, the market has been segmented into North America, Europe, Asia Pacific, Latin America, and Middle East & Africa. Demand for road marking materials in each technology type has been analyzed and forecast for a period of eight years. The report also comprises profiles of leading companies in the road marking materials market. These include The Sherwin-Williams Company, Geveko Markings, Aximum S.A., Kelly Bros Erinline, Swarco Limburger Lackfabrik GmbH, and Ozark Materials LLC. Various attributes of these companies such as company overview, business strategies, and recent developments form the core of the company profiles section.